Since I started using Ninjatrader with version 7, I never liked their DOM. In fact, I found it next to useless. I purchased a third party DOM that was light years ahead of the inbuilt NT7 one in terms of information provided and update speed. When I migrated to NT8, the new inbuilt DOM did/does have some interesting features, but it still lacks usability for me, especially for order management. I already had looked into putting together my own dom a long time ago, but with the cost of my time, it was far cheaper to buy the third party one. Recently though, after chatting with a few people and wanting something for my order management that neither DOM does, I decided to resurrect the project. I’ve started afresh in NT8 and have a proof of concept running. Here is a screenshot of the DOM, running alongside the NT8 one.The T&S on the left is for debug only at the moment (it is not managing the CME splits yet), but will be part of the DOM. Here is a short video of it in action. It’s pre market, so things are quiet on the ES. The project is actually an external class, developed in visual studio. The only connection to Ninjatrader is in fact a short stub that you add to the chart as an indicator. 99% of the code is external to NT. This means this DOM is actually portable. Just write a new stub in whatever to send a tick stream to the DOM and it should work with any platform. If you liked this or found it useful, please let me know in the comments section below, give it a like/share above, or if you wish to share some trading knowledge, get in touch. Thanks! You need to put an agregations/cancellations columns on your Dom. 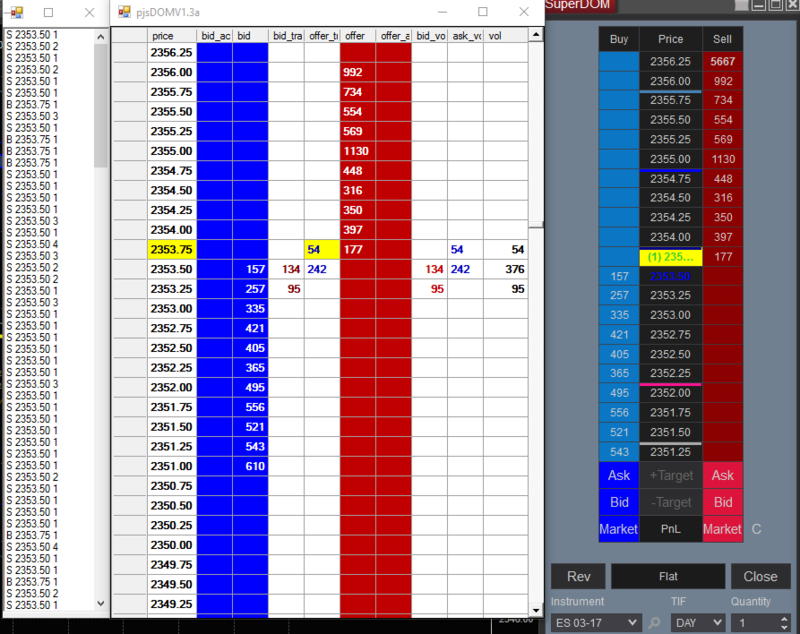 Looking this info you are able to understand the play of market makers and HFT´s. If you want more info about how and where I use it, send me a mail. It’s very, very early Alpha at the moment, plus I’ve not done much work on it recently. It’s not ready for distribution just yet. Once it is, I’ll update the site. Thanks for looking. Any tips on how i can code something like this. I’m a newbie python programmer and there are tons of libraries and frameworks for trading. I want a DOM with more information but I don’t want to pay a company a ton of money. I would buy something like this for $200 or so but I wouldn’t mind ccoding my own. It would be a fun project with a lot of equity. I am an institutional algo guy (I ran across this because I am also integrating some of my software with NinjaTrader in order to be able to back test some higher frequency algos) but I am a decent C# WPF programmer (I say decent because I mainly program server side Java). If you have any interest in some help (either directly or in kind knowledge about institutional algos) and/or alpha/testing track me down on LinkedIn. I checked your profile and we are 3rd level connections so unless you have InMail it isn’t easy to connect. I am one of the moderators of the Algorithmic Traders Association: CTA & Quant Funds System Trading | Stocks, Futures, Forex, Options group; as such, I post a decent amount. If you care to, find one of my posts and pm me; I will give you my email and we can discuss things further.